RETIRED | JOHN E. ENGLISH, admitted to bar, 1959, Illinois; 1961, Michigan, U.S. District Court, Eastern District of Michigan, U.S. Court of Appeals, 6th Circuit. Education: Washburn University of Topeka (B.B.A., 1957); Northwestern University (J.D., 1959). Field Agent Attorney, National Labor Relations Board (1959-1961). 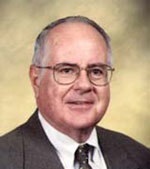 Adjunct Professor of Law, University of Detroit Law School (1969-1999). Member: Board of Trustees, Detroit Bar Association Foundation (1977-1981); Detroit, Illinois State, Federal and American Bar Associations’; State Bar of Michigan (Elected Member, Representative Assembly, 1976-1982); American Immigration Lawyers Association.